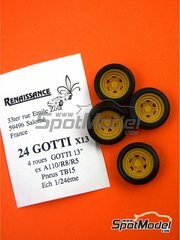 Set of 4 rims in injected plastic and 4 tires reference 10004 in 1:24 scale, including caps for attaching the rims to the model. 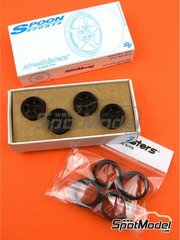 Rims dimensions are 18.3mm diameter and 10.9mm wide. 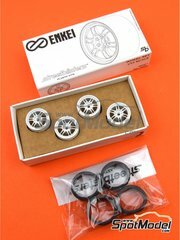 Set of 4 rims in injected plastic and 4 tires reference 10004 in 1:24 scale, including caps for attaching the rims to the model. 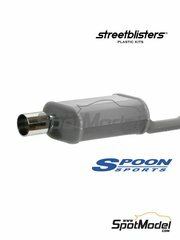 Pack of 2 exhaust tails with straight cut, made of stainless steel and chrome finish. 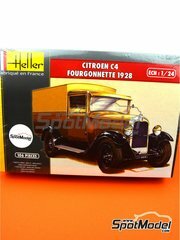 Made in 1/24 scale. 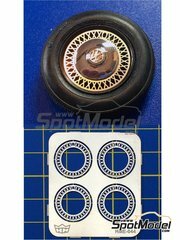 Set of 3 Spoon Sports SW388 double boxes recreated in 1/24 scale. 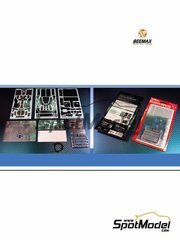 The sheet includes 3 pre-cut boxes and a vinyl sheet for the seals. 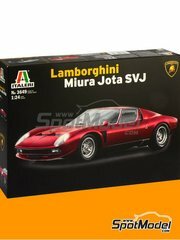 Time-limited re-edition of the Lamborghini Miura Jota SVJ kit by Italeri. 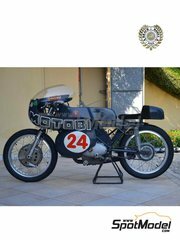 Catalogued as skill level 2, measuring 18.3cm long once built. 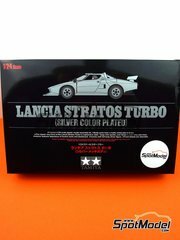 Decoration for the Tamiya Lancia Stratos Turbo in 1/24 scale, recreating the unit sponsored by Marlboro that participated in the 1976 Giro d'Italia. 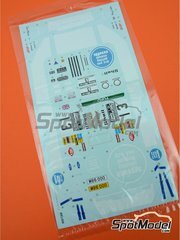 Tobacco sponsors are also included in an additional decal sheet. 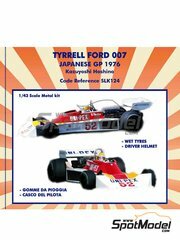 New kit from the Tameo Silverline series, this time recreating the Tyrrell Ford 007. 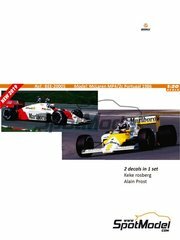 The kit includes rain tires and driver's helmet. 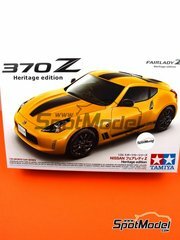 New edition of the Nissan 370Z Fairlady Z now in its "Heritage edition" version. 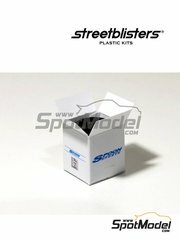 Includes new decals in addition to the usual plastic parts, paint masks, rubber tires, etc. 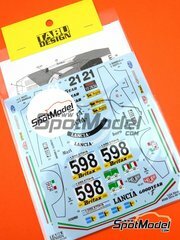 Newly designed and printed decals for replacing your old decals of the Tamiya Honda Mugen NSX. 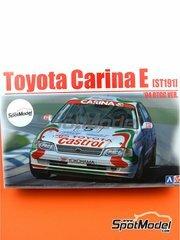 Includes both Motegi and Allstar GT 1998 decorations. 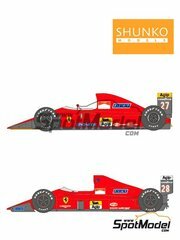 Newly designed decals by Shunko for replacing those of the McLaren Ford M23 kit in 1/20 scale by Tamiya. 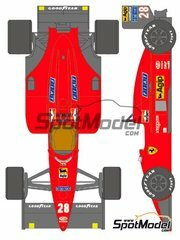 Newly designed and printed decals so you can replace the old decals of your Protar Ferrari F187 kit in 1/24 scale. 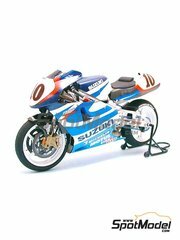 Improved re-edition of the veteran Tamiya reference 24003, originally published in 1977. 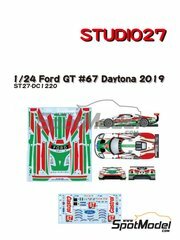 This new edition includes a spectacular shiny metallic finish on the body of the Stratos, as well as in the "B" parts (except the pilot) and in the "C" parts (rims, ...) , and also includes the pilot figure. 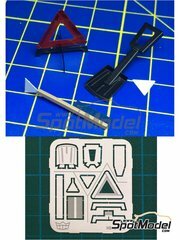 Tamiya did it again, surprising us with technological innovation by using a special mould to manufacture the whole cowling in just one piece, something never seen before. 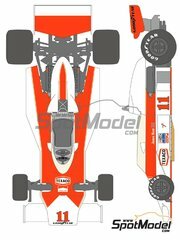 All the cowlings and gas tank can be detached to show the fully detailed engine. 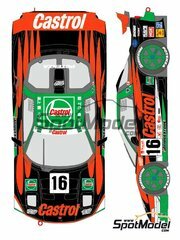 The decals include the numbers for Roberts Jr., Aoki and Kagayama. Set of winter tools, made in 0.2mm millimeter photo-etch. Includes a warning triangle sign, a shovel and an ice scraper.